I've been a bit slack lately, my apologies. Life is being, well, life, and getting in the way of blogging. I have so many things I could write about, want to write about, but then I get distracted. So, this blog post is going to be another one of those, 'Catch up on Sif's crazy world' type of posts... Here goes. This went well. I've nailed down - okay, blue tacked down - my PhD thesis topic. I've been warned to keep schtum about it because, well, it's just so brilliant! Actually because it's a relatively new area of research, and being so new, it's wide open - which is great for me, but also a bit tricky... I can tell you it has nothing to do with Icelandic folklore, but is something I'm very excited about nonetheless. Once I've had my proposal accepted, I'll tell you all about it. I have the proposal well under way and, with any luck, will have it submitted by the end of July. Woot! It's all happening here! Luey just had a birthday on Monday and turned eleven. I felt a bit bad about not blogging this milestone, but at the same time there wasn't much to blog. 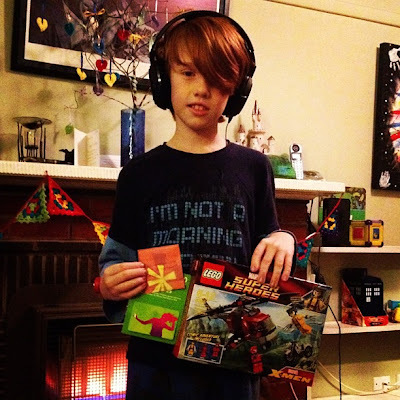 He turned eleven, got a set of groovy headphones, some lego, and a promise voucher for a Master's Sonic Screwdriver (what every eleven year old wants, right?). Oh, and an iTunes card; which reminds me I want to say something about kids presents these days, but that is a blog for another day - maybe tomorrow! When I was a kid, reports were so much more simple; Reading, Writing, Maths, Geography... None of this making friends and thinking esoterica. 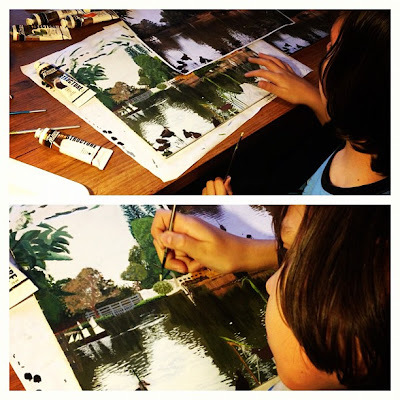 Are you sick of seeing pictures of Erik's painting yet? Well, today is his very last opportunity to finish it. He has to hand it in tomorrow for the exhibition opening at the Ian Potter Annex at Federation Square on Sunday. He's had yesterday and today off school to complete it (last minute rush - thank goodness the last week of school is always a bit of a slack week anyway). Call it homeschooling! His actual licence arrived on Monday. He won't let me take a picture of it - he's so mean! The mother-of-all-pimples is beautifully obscured by some print. He looks like someone you wouldn't want to meet in a dark alley - I think it's AWESOME! We're working on the issue of getting a car and are thinking of possibly using the tax money we were going to put aside for Erik's high school uniform, books, and fees to get a car instead. The thinking is that with a car the GOM might have a better chance at getting a job which would then pay for all the high school stuff, and more. It's a gamble though. I don't know. We don't have to decide just yet. Last night he had a terrible nightmare. I don't know what it was about but I was woken by his making a noise and then shuddering. I couldn't tell if he was laughing in his sleep or crying. It was the latter. He didn't want to talk about it. The very odd thing is that he remembers the dream vividly and usually he doesn't remember his dreams; they're just a jumble of chaos. I find this unsettling. I still can't shake the feeling that there is so much fear and anger in society these days. The other night I felt all but compelled to wash myself down with scrubbing brush to try and rid myself of the grittiness of it all. Take Mia Freedman, for example, and her article attacking women who write birth plans and placenta plans in an attempt to control the outcomes of their labour - 'birthzillas' she calls them, dripping with mockery. I don't disagree with all her points. I also believe you can't control birth - whether you actively avoid hospitals and any form of medical supervision, or if you actively opt for an epidural on arrival and a c-section. Control is an illusion when it comes to birth. Influence, however, is not and many women write birth plans to have some influence over outcomes rather than simply handing themselves unquestioningly over to people who fear natural processes, as Mia evidently does. Mia's fear of birth is palpable. Time and again she's said it is dangerous and time and again she focuses on the possibility of death over life - even though all statistics (from all quarters) show that the likelihood of surviving birth (both for mother and baby) is far greater, even in the darkest Amazon, than not surviving it. So, Mia's fear leads her to mock women who don't or won't make the same fear-charged choices as her, and she doesn't understand their level of trust (of course, she doesn't, she has too much fear). But Mia isn't alone in her fear. It seems most of society is suffering from this deadly disease. Fear is what causes people to hate other people because they're different looking, different sounding, different choosing. Fear causes people to kill their children. Fear causes people to ridicule one another and nitpick and snipe and troll. All this fear leads to anger as people defend themselves and their choices, or question themselves and their choices and fear losing their own understanding of who they actually are. Some people seem to thrive on spreading fear. Politicians excel at this. 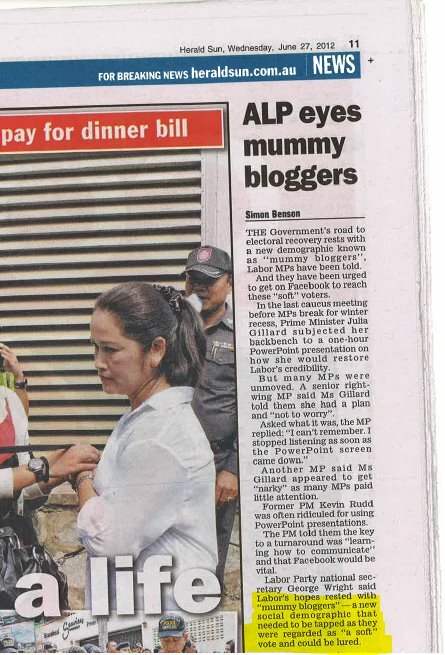 This morning I read about an article which suggested the Labor party is focusing on 'mummy bloggers' as 'soft voters' as a vehicle to sell their policies. Apparently, this information was given to the media from within the Labor Party. Using the word 'soft' to refer to women was almost guaranteed to raise hackles. To what end? To create resistance to the Labor Party? Why would Labor MPs want to do that? Is it because the party is still split, despite cries of unity? Or is it a beat up from conservatively controlled media? Using the word 'soft' rather than 'swinging' also creates fear, particularly for women who fear being viewed as soft, because soft is equated with 'weak'. Why is 'soft' the same as 'weak'? Is it because men are not viewed as 'soft' - says who? It all comes back to fear. Fear and anger. There is plenty to go around... Pull up a chair, have a slice, but watch out, it'll go straight to your nerves!